The staff at St. Paul’s Weekday Nursery School have an over 10 years’ average experience as educators. 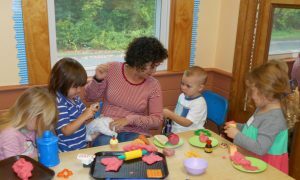 All of our educators are MA Department of Early Education and Care certified, maintain CPR and First Aid certification through the school, and use workshops and websites to expand our Early Childhood Education knowledge, skills and curriculum. Sharon Healey – Sharon has been the director of the school since July, 2016 after spending thirteen years as a classroom educator. She is the mother of two adult children who have been inspiration for her work; their preschool experiences at St. Paul’s Weekday Nursery School convinced her that she needed a career change and that included children in the preschool setting. Error: Error validating access token: Session has expired on Thursday, 16-Aug-18 19:01:59 PDT. The current time is Tuesday, 23-Apr-19 06:03:54 PDT.